A week later, and I am still on my WoW break for the most part. I find that when my guild is not raiding, I have little incentive to log in at the moment. I am one of the strange freaks who would have preferred some well-done Darkspear Revolution dailies instead of the weekly grind quest. I have been leveling my priest a bit, she’s now 82, but I have no pressing need to get her to 90. Instead, I have messed around with my Steam collection and even test-played Civilization V this weekend as it was a Steam offer to play it for free all weekend. That’s definitely a cool way to give incentive to buy a title that’s on sale, by trying it out first. The last couple of days my game time has been eaten up by Tomb Raider. Not something I ever thought would happen. The last Tomb Raider game I played sometime in the 90s was TR2. I have fond memories of doing so, and most vividly remember the Venice levels, driving my speedboat over ramps and not making the jumps, to die over and over again. Tomb Raider 2 was hard! To this day it remains the only Tomb Raider game I ever beat. I tried TR3 and was already defeated by some of the early jumping parts. Never went back. I vaguely remember watching the first movie. 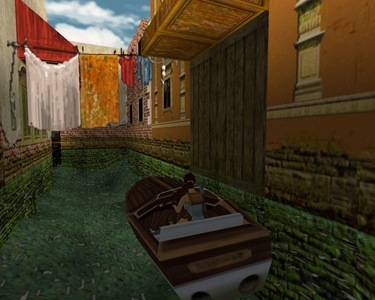 Seriously, the Venice parts with the speedboat were the best! The latest Tomb Raider game, released earlier this year, is considered a Tomb Raider reboot. Reboots of popular franchises, turning them darker and grittier, for example Batman, seem to be really hip these days. It’s supposed to be Lara’s origin story, so why not call it Lara Croft Begins, to call up the Batman reboot again. Btw, how insane is it they’re planning yet another Batman reboot now that Nolan is done? Crazy, if you ask me. But back to Lara. She’s a 21 year old archaeologist stationed on a ship called The Endurance, and her crew is looking for an old Japanese kingdom called Yamatai. Dude, Yamatai is a cool name, sounds much better than Yatalai (my DK). Name change incoming? Lara is convinced that Yamatai is in a bad weather region called the Dragon’s Triangle. When they set course there, a storm drives them towards an un-named island, wrecks the ship and strands them all on the island. So far, so bad. It gets worse, because there are other people on the island, and they’re not friendly. Their favorite pastimes are kidnapping, gruesome sacrifices, and recruiting people into their crazy cult called Solarii. 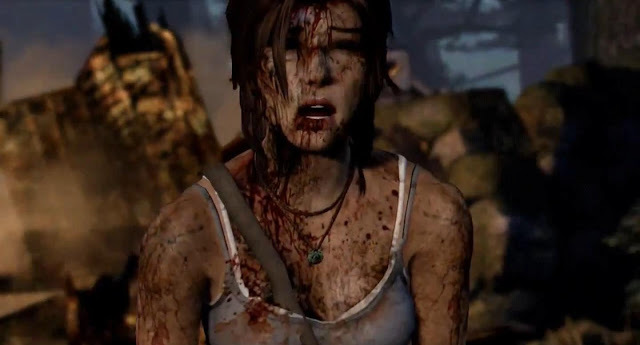 Tomb Raider doesn’t start you off nice and easy. Lara is dragged away by them right at the start, and has to free herself immediately, in about an hour that’s probably the most intense and panicky gameplay I have ever experienced. The game is a one woman against the world story that takes Lara through about as much hardship as you can possibly imagine, while looking increasingly dirty and bloodied. Dark and gritty. It’s a style decision. There’s nothing neat about trying to stay alive here. Gameplay-wise, there is very little similarity between my TR memories, and this new game. There’s jumping and there’s shooting, and surprisingly very little tombs to explore. It’s incredibly linear, which for me is a draw. I like linear games. I always know what my objective is and that I can only get it by moving forward into areas I haven’t been yet. It plays more like a 3rd person shooter than a jump and run game. For those who are shooting averse, it’s not any more difficult than the shooting parts in Mass Effect, for example. Lara automatically takes cover where she can, and can easily move from cover to cover. While initially you only start out with a bow and use it to hunt animals for survival, you later get more weapons and can enhance them to become deadlier. Fire arrows shot into oil barrels are very satisfying. The jumping parts are usually very frantic. Expect the unexpected because it’s likelier that stuff will collapse under your feet as you jump. There’s this whole section where you jump from wooden house to wooden house in a mountain village and everything around you falls apart. Quite crazy. 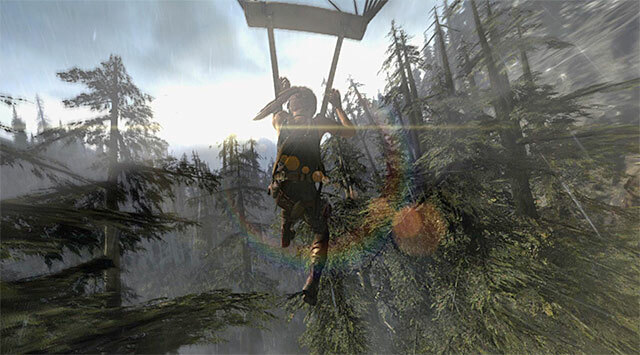 There are slower jumping sections as well, where you have to scale mountain walls, and even the one complex jump or two, but nothing crazy, compared to old Tomb Raider games or Assassin’s Creed. In older games, tombs were the core gameplay. Solving complex puzzles and performing crazy jumps. The new Tomb Raider has a few optional tombs that are off the beaten track. I find rewards and experience you gain from them quite excellent, and they are fun. Which makes me wish that maybe there was less shooting and maybe more tombs. Just saying. The tombs are all fairly small once you get there, and all seem to follow the same mechanic. There’s a treasure chest somewhere in it, and you have to figure out how to get there, by solving a major puzzle. So far the most clever puzzle involved the effect of wind on a cage needed to perform a jump. Good fun. The last element of gameplay are Quick Time Events. I tend to like events like that, but some of them are INCREDIBLY ANNOYING. There, I yelled that. Maybe they’re better when you use a controller, but there was one QTE that nearly broke me. You have to enter a wolf’s den, and as tends to happen in such cases, you get attacked by a wolf. You then have to mash left/right in sequence to struggle with the wolf, then press F to kick the wolf, then press E to kill it. It’s tightly timed, and I had to watch Lara get eaten many many times. Miss the right moment to hit F by like a second? Bam, you are dead. That was aggravating. Similar rage was inspired by a section where you have to navigate Lara through a forest while wearing a parachute. A dozen tries later, Lara finally survives her parachute adventure. If you fail a QTE, Lara dies, and I have to say, whoever designed Lara’s death screens is…maybe a bit of a sicko. The amount of gruesome deaths I have looked at while playing this game is quite high. Fall down a mountainside and end up in the spinning propeller of a crashed plane? Yeah. Impaled through the neck on a metal part? Or above parachute section where you get impaled by large tree branches, plus the matching sound effects. Tomb Raider is full of those unnecessary violent touches. I already feel bad about Lara dying, don’t make me feel worse, sheesh. It’s definitely not for the squeamish. Within the first 30 minutes, Lara falls onto a large screw and yanks it out, and then later self-cauterizes it. Thankfully, the cauterizing is no visual experience, just an audio experience. Gore is everywhere on the island, and you will get no warning. It’s a bit much. Speaking of audio, I have to mention that I am not 100% sold on the audio. Lara’s voice acting is quite good, but she yells, cries, screams a lot. The female reviewer at Eurogamer said it might add ambience to a violent pornographic film your neighbors might be making. She’s not wrong. My SO is always happy when I make it past a tough section, so that the screaming will end. I get that Lara is supposed to be this young, inexperienced girl who does all these things to save herself and her crew, but I still think the crying is a bit excessive. I think I have scraped together all the negatives I could think of, but to tell you the truth? I would rather be playing Tomb Raider right now. I am about 40% and wish it would go on forever. It’s a gorgeous game. 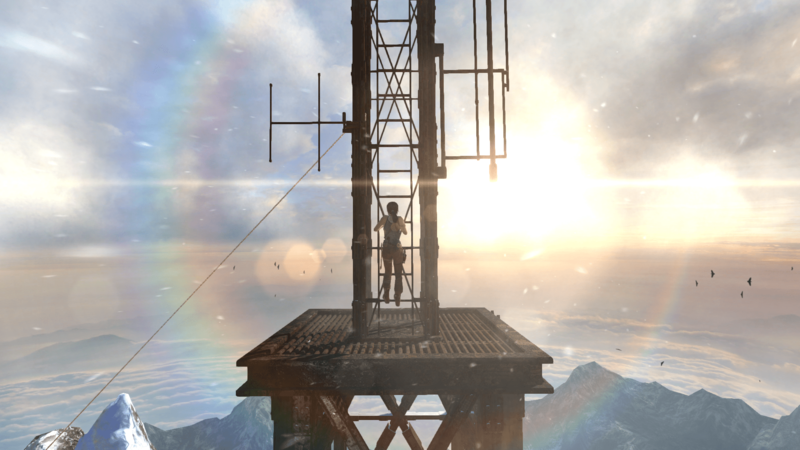 There’s this one moment where you climb to the top of a radio tower, and everything’s just gorgeous. It makes me very happy that I just got a new video card, a Geforce GTX 660, and can enjoy the game on the highest settings. That’s only a glimpse of the view as you climb to the top of a radio tower during a snow storm. Most importantly though, all of the gameplay above plus the visuals plus the story make this an incredibly exciting game to play. I want Lara to rescue her crew, and find out what’s going on, and get off this freaking island, and gasp some more in awe at some hidden temple in a valley. I am happy I bought this game, because now I finally get to experience a game that’s similar to Uncharted. If I had to rate this game, I would give it 8.5/10, the only real minus points being some of the QTEs, and the needless level of gore. After this, I might finally finish Assassin’s Creed: Brotherhood, because I miss Ezio scaling all walls of Rome and the far more challenging jumping required in AC. I’m glad you’re liking it! I still haven’t picked it up… just being slow I guess 🙂 but I’ve definitely had my eye on it for a while! I played some more after posting this, and had a stretch with little combat, but a lot of jumping and trying to figure out how to rescue people. There are some stealthy elements, and you can avoid heavy combat if you silently kill someone. It’s no Deus Ex, but I wish there was a bit more stealth element here. It would have been just as fun a game if not more if it was less a shooter and more a Tomb Raider. I am very interested in Bioshock Infinite, but I maybe should try to finish the previous two games first. I no longer remember why but I stopped playing Bioshock somewhere in the middle. How’s the story? I find I need to be fully immersed by great story content to truly enjoy a single-player game. I enjoyed the story quite a bit. Was very interested in the character of Elizabeth, thought her integration into the game was really well done. I was not as taken in by the story as a lot of other people, did not think the ending was as brilliant as a lot of other people did, but I still enjoyed it enough to push through and keep playing 🙂 A lot of games now don’t quite hit that level of interest to me, so I guess I’d call that a win haha. I didn’t play either of the first two games (as you might know), only watched Chris play through most of the first and don’t really know anything of what happens in the second. I do have some friends who said there are a number of points in Infinite that are cool if you have played the previous two games (and mean nothing to people who haven’t played them) but I felt like I had a complete experience without the first two. I did feel that Infinite was not scary almost at all. Like there was some really creeptastic racism stuff going on but it wasn’t scary the way I found the original Bioshock scary. i found tomb raider to be fun while confusing,. …. i mean will the solari just give her a break??? no instead they drop everything they are doing to ambush lara at any given moment. ….. the element of surprise is quite high in this game, it almost seems like a thriller if it were a movie..